Should You Buy Solazyme After Its Big Drop? 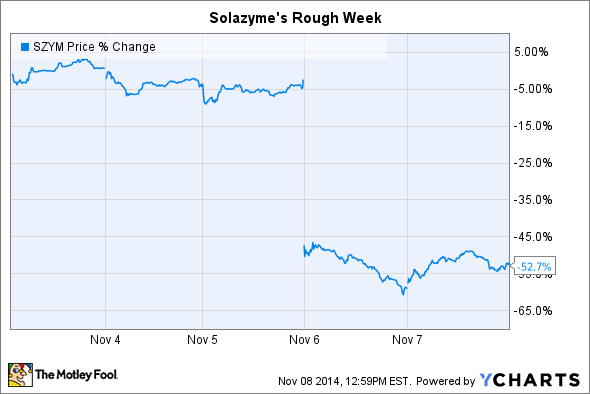 Solazyme stock went cliff-diving last week. Is it time to buy? Here at Fool.com, our contributors are individual investors just like you, and from time to time they like to bounce investing ideas off each other. Here is a recent exchange between Fool.com columnists Tyler Crowe and Maxx Chatsko. Tyler: I think anyone who looked at stock prices last week had their eyes pop out of their heads when they saw Solazyme (NASDAQ:TVIA) drop 58% following the less than encouraging news from its recent earnings release. After reading your piece that highlighted what has been going wrong lately, there was one lingering question for me. As of late, we have seen Wall Street overreact to companies in the energy and materials space because the short- to medium-term outlook doesn't look that rosy. Despite the issues you mentioned, is Wall Street doing the same thing here with Solazyme simply because the company couldn't meet Wall Street's overly ambitious targets? Maxx: History demonstrates that Wall Street has never been successful at setting expectations for Solazyme, which is a development-stage company still proving its business and technology strategies. Wall Street absolutely whiffed on revenue estimates for 2014 and again for revenue estimates in 2015. Investors shouldn't pay any attention to analyst estimates until Solazyme gets back on its feet and operations provide more visibility. However, the reaction last week had little to do with quarterly earnings or Wall Street's expectations. Solazyme announced a major pivot in commercialization strategy that delayed its own internal targets for production volume, revenue, earnings, and expansion by at least two years. The company didn't have enough near-term customers to justify ramping production to full capacity and is still experiencing technical issues with its largest commercial facility in Moema, Brazil. Therefore, Solazyme is refocusing on producing high-margin products with limited capacity to buy time to further develop markets for its products. Investors may recall a similar strategy shift after running into technical and market development hurdles from industrial biotech companies such as Amyris and Gevo in recent years -- both of which Mr. Market punished in similar fashion. Tyler: OK, now, some might call me opportunistic -- and others might say I'm masochistic -- but I have been buying a few energy and materials stocks that have been getting absolutely crushed as of late. To me, the long-term prospects (five to 10 years) of these companies look too good to pass up, and other investors are giving too much credence to what's going on today or in the next 12-18 months. Now, we all know based on this earnings release and your work that Solazyme may look like it's "barely hanging in there" while it works out its production and fermentation issues, but what about further down the road? Does the five- to 10-year outlook for Solazyme look good enough that it's worth buying now and waiting for those better days ahead, or is there simply too much uncertainty there to make that kind of call? Maxx: As long as there aren't any looming technical hurdles that investors are unaware of, Solazyme's long-term potential remains intact. By the end of the decade, it's quite possible that the company drives down production costs, builds new commercial capacity, and delivers big profits on high growth for years to come. That would make a sub-$300 million market cap an absolute steal, but what happens in the next few years will be critical. Solazyme's Encapso drilling lubricant will now be the main focus of production in Clinton, Iowa. It realizes high margins because of the minimal processing requirements. Source: Solazyme. Solazyme will now follow the road most other industrial biotech companies have taken by focusing on high-value, high-margin products rather than high production volumes of low-value commodity replacements. It's the correct move to make to stem losses in the near term -- and Amyris has demonstrated that such a strategy can provide a bridge to the high-growth, long-term future that investors originally envisioned. Of course, it's still important to remember that Solazyme may need a few quarters to make the transition and make the big reductions in total operating expenses. With that in mind, investors will want to keep an eye on how fast operating expenses are dropping and whether gross product margin on ingredients and intermediates are improving with slightly increased capacity next year. Solazyme won't be able to hit its target gross margins with limited capacity, as production costs will be too high, but if the shift to high-margin products can be shown to work for the company's platform in 2015, then it, too, could build a bridge to a high-growth future.